It’s September 28th, 2007, around 1:00 am. My wife was gently sighing in her sleep in our luxurious Masai Mara safari camp tent. I was in charge of downloading and backing up the compact flash cards from our Nikon D200s. Even at 10.2 Megapixels per image, those old CF cards were full and painfully slow. The tent’s multilayered closure flap was being breached by the hairy leg of a resident vervet monkey. I rebuffed the assault, secured the tent and returned to the laptop for a second shock. 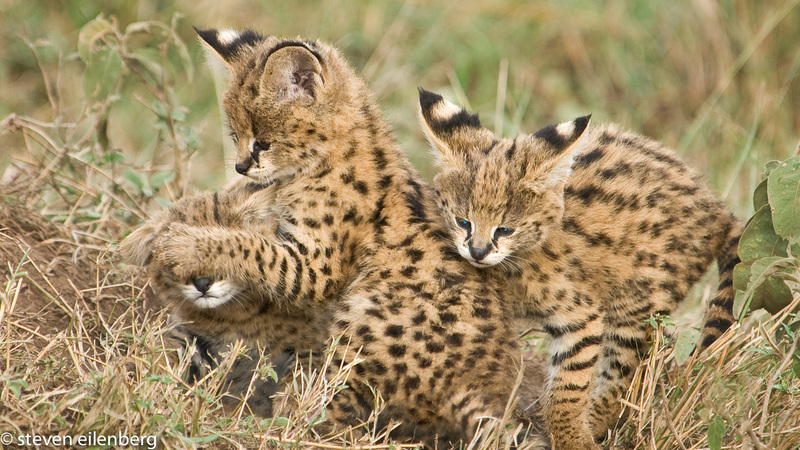 One of the CF cards was corrupt… and it was Marie’s!… and, we shot serval kittens on a termite mound that morning! While this was long ago, it could happen to you tomorrow. What will you do? The Flash memory cards we use today were invented by Dr. Fujio Masuoka working for Toshiba in the early 80s. Not to worry, he got a bonus for his multi-billion-dollar invention. There have been many iterations since then, some having gone the way of the dodo or Betamax and VHS tapes for that matter. New ones continue to emerge. The not-so-complete short list of memory cards, in ascending order of physical size: MicroSD, SD, CF, C-Fast and the XQD card. Over the years, these cards have become much faster at reading and writing, have higher capacity, while the cost per MB has drastically fallen. With 4K video recording and rapid-fire >40MB/image cameras increasingly common, these cards are really being taxed. Choosing the right card for your particular camera and shooting style is more important than ever. Physically, these cards have more in common with Superman than with you or me. They can tolerate a prolonged submersion in water and extreme temperatures (think washer and dryer with a card in your jeans pocket). They are hard to crush, highly impact resistant and could care less about X-Rays or high magnetic exposures. Flash memory cards like camera shutters have limited lifespans. Shutters are measured in opening and closing. Memory cards have limits on how many times they can be reformated. Flash memory cards can get gunked up with bits of old data files. A new SanDisk 64GB Extreme Pro SDXC UHS-I Memory card can be purchased from B&H for just $36. Pennies saved on using old cards are nothing compared to losing photos while on safari. Get the best card reader you can find. A bad reader can be a point of failure. Even if you have a computer with built-in SD card reader, consider traveling with a spare USB card reader. Your computer’s card reader can fail, either through hardware or software. Do not delete individual images from your card in the camera. Your camera does a fine job formatting a card and a second-rate job erasing individual images. Format the card after downloading it. Format it in the camera that will be writing to it. The practice of formatting cards does have some critics. True, there are people who smoke and don’t get lung cancer and even people who don’t brush their teeth and have no cavities. The best practice is to format after every download. Don’t take a formatted card from another camera and assume it is good to go in yours. Reformat it with your camera. Don’t routinely fill your cards. Leave some breathing room. Always have extra cards with you. Don’t pull out your memory card when the camera is still on, or when data is still being written. Wait a few seconds after the write is complete before pulling the card. Some cameras shut off the power when the card bay is opened. Don’t let the camera’s battery die. It may die or take its last breath while writing an image to the card. This is not a good thing. If the camera has a second card slot, consider using it to back-up the main card. Consider using several medium capacity cards and changing them out during the shoot instead of a single giant-high-capacity card to hold all of your images. Write the purchase date on the card to know how old it is. Finally, when a card has become corrupt, try to rescue the images Never reformat and use it again. It is time for it to be tossed away. Don’t panic! Time is not of the essence. Don’t reformat. Instead, sequester the card and think about it. Take a look at the card. Is it physically damaged? Is it corroded? Are the contacts clean? When using a CF card, look at the contacts in the camera’s CF slot. Is there damage? Are all of the pins straight? CF cards can be inserted incorrectly bending the camera’s contacts. This is a much bigger problem than a corrupt card. Examine the card reader. If it is a built-in is the slot full of lint? Blow it out with compressed air. Try a different computer. Try a different card reader. Try a different USB port. These programs are not manufacturer specific, so you can use them with other branded cards. Note that with trial versions of rescue software, only recoverable images are shown and you may not be able to save them to your hard drive until a full version is purchased. The program takes a while to examine the card. Eventually, the software will present a list of images that are recoverable. Rescue what you can to a hard drive and wipe your brow. After this, trash the corrupt card. If you have tried the above, and have bupkis to show for it, you can take it to the next level by employing a card recovery service. They should have better luck, but it will cost you, typically between $100 and $500 depending on how large and damaged your card is. This may be chump change if you are a wedding photographer. SanDisk, for example, recommends LC Technology for deep recovery. Buy newer, brand name flash memory cards. Toss the old ones. Have a good card reader and a backup reader. Never delete individual images in camera. Format the memory card in the camera that will record the photos. Don’t format a corrupt card in an attempt to “fix it” before trying image recovery software. Do have extra cards with you. Keep them in a card wallet. Trash any corrupt flash memory card, even if you were able to recover its images. Don’t act in haste. Time is your friend with a corrupt card. Steve Eilenberg is a San Diego-based photographic artist, one half of Aperture Photo Arts, along with his wife, Marie Tartar. Steve’s photographic explorations extend from above (drone landscape photography) to below (underwater), and he has an affinity for street and X- ray photography.His images have been displayed at the San Diego Natural History Museum, Oceanside Museum of Art, Birch Aquarium,Smithsonian National Museum, Museum of Photographic Arts (MOPA) and Mingei International Museum. See more work at www.aperturephotoarts.com. Excellent thoughts on card health and safety. Did you recover your wife’s images? thanks traingeek. i downloaded someone’s recover software at the camp. it recovered most of her images. we reused the card and two days later, she had another card failure. i was looking pretty suspect by then as only her card was failing. i recovered most of that card too then tossed the card. On the next trip, she was in charge of her own downloads and we have been traveling with two laptops and multiple back up hard drives ever since. thanks for your comment lewis. you are correct. it is not perfect but having a date on it gives you at least one metrix. current name brand cards are pretty robust. 10,000’s of thousands or more cycles should be possible, far more than shutter actuation on many cameras. failures are becoming increasingly rare, if proper card hygiene is observed. having a date on the card (if cards are being cycled) gives you a rough idea of how much you have used it. many of us still have old small capcity cards. even without a date on them, i know they are old and have tossed them. last year, a few years ago, i tossed a 1GB CF card containing a spinning hard drive. this might have a place at the Smithsonian but no place in my card wallet. Good point, Lewis. I know of no such method to see how many cycles the card has had. If the card is small capacity and very worn looking, I will trashed it. If it has a relatively recent date on it and is higher capacity, it is probably fairly new (or at least new enough). Newer (quality) cards are going to be more robust and, for most of us, have enough cycles in them that random failure is much less likely.